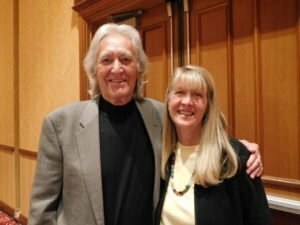 Former internal medicine physician and New York Times bestselling author, Larry Dossey, MD, explains how your individual mind is a part of the infinite collective dimension of consciousness. This is the One Mind which is accessible by all. By seeing yourself as a part of this One Mind, you naturally feel more loving towards yourself and others. Greg and I met Larry in Las Vegas June 2018 after my presentation at the IRVA & SSE (International Remote Viewing Association and Society for Scientific Exploration) combined annual conference. Greg said, “Look, there’s Larry – we didn’t get to talk to him at the last conference where we all spoke and we need to connect because we are of like mind.” Larry had just heard me speak about how you can communicate with loved ones on the other side because we are connected in consciousness. Because he understood this connection, he said “Hi – you are my new best friend!” It was a heartfelt recognition that we were meant to connect within the One Mind with like-minded souls. In this interview, Larry explains how connected you are to all beings through your consciousness. He gives evidence of this through stories. You can find more on this topic in his latest book, One Mind: How our Individual Mind is a Part of a Greater Consciousness and Why It Matters.I have been reading his books for years beginning with his 1982 release of Space, Time & Medicine, and highly recommend them. Dr. Dossey is a pivotal contributor in our field of consciousness and healing. Larry Dossey, MD, is the Executive Editor of Explore: The Journal of Science and Healing. He connects science and spirituality in healing.